One Wave to sweep them all? With the announcement of Google’s new communication and collaboration platform Wave the expression « surfing the net » gets a new meaning. This article (in French) explains in detail what Wave will mean and do for those who already use Gmail, GTalk and all those so nice other G-applications. One thing I always liked about Google is that, as an outsider, I can see that the company is never betting on a single horse, but develops many different things by many different groups, trying, playing, sometimes successfully, sometimes not, but then again, a failure is never really a failure if you learn something from it. They also let the users play with their products as they develop them and this gives you an impression of being let into their play garden. The consequence is having different interfaces, with different visual styles, coming from different hands, but this is exactly what I like. Now, with the Wave, it looks like Google did not resist the temptation of making an application to « do it all ». In the startup world this is probably the worst thing to do, but Google is not a startup and with the mountain of things they have tried and proved worthwhile so far the Wave will probably become a success. And it is a very logical step. 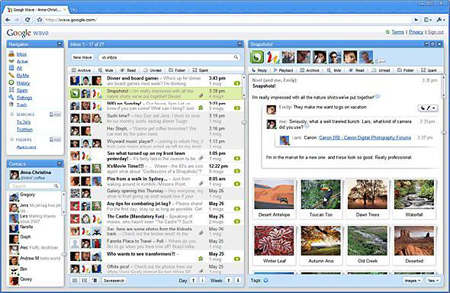 If you had Gmail, GTalk, Picasa and YouTube already under your roof, it would be silly to not at some point merge them all in one seamless whole for the user. This is, in short, what Wave does. Besides, it somewhat resembles Facebook newsfeed, incorporating also the social aspect. And add to this Google Docs and voila, you have covered most of online collaboration. I think they hit the target with the word « Wave », because hardly any term describes so well what the world around us is about: ever-changing and ever-moving. The screenshots looks still somewhat overwhelming visually, but let’s wait and see. Highly recommended: this article in New York Times In South Korea, All of Life Is Mobile. It describes how the younger – and also less younger – generations in that country use their mobile phones for… well, practically anything. Identification, pocket money, payment in stores, television set, book reader, magazine, music player, internet, yellow pages and so on and so forth. The number of things they can do with phones is dazzling. I especially like the example of sending your friend a gift, a pre-paid Starbucks coffee, which she then can pick up by showing the gift icon on her mobile at any Starbucks. Paying by mobile instead of cash or credit card is called T-Money. A university lets their students use mobiles as ID cards, because, as all students, they would much sooner forget their ID card than leave home without their mobile. No need for a wallet (a relief for those whose wallets, like mine, have been stolen) and I am quite sure they have inventive solutions for stolen phones. I wouldn’t be surprised if a stolen phone becomes useless by itself, or engages in self-destruction, or takes the thief to the closest police station because it knows exactly the thief’s location – and that of all the police stations in the city. The fact I found most fascinating is that a young person in South Korea changes his or her phone once a year. I don’t quite see it happening around here. Yet. Is Industrial Design the New Interface Design? A Yahoo survey conducted in Italy shows that cellphone (affectionately called « telefonino » in Italian), internet and e-mail are nowadays more important to Italians than coffee. 43% of Italians would not accept to live without a cellphone, against 24% who would not accept to live without coffee. 61% of Italians say to feel lost without a cellphone when traveling. Having recently traveled to Sicily and back I could witness this mobile phone addiction of Italians. What is the first thing any person does after the airplane touches ground and the « fasten seat belt » lights go off? Correct, switch on his or her mobile phone. As I was waiting in the ail to go to the exit, with my mobile in my hand, I looked around me and saw an Italian women get not one, not two, but three different mobile phones from her purse. She switched them on one by one and then checked the messages and the missed calls – one by one. I turned to my left and saw an Italian man holding not one, not two, but three cellphones (all different, of course), which he was switching on and checking one by one. The guy next to him was not quite as advanced: he was looking only at two cellphones and feeling no doubt suddenly inferior to his neighbor. But definitely superior to me. Vous vous trouvez dans les archives du blog de Use Design pour mai 2009.